While it can be argued that amateur athletics are quickly becoming professionalized in today's day and age of television coverage, multimedia and million-dollar endorsements, high school sports reflects more than simply the games themselves, and often are an extension of a community's heritage and cultures. In Friday Night Lights, Buzz Bissenger peeled back the curtain on Texas high school football and examined the resonating social issues surrounding the Permian Panther team and the town of Odessa. In The Miracle of St. Anthony, Adrian Wojnarowski looked at the inner city HS hoops dynasty Coach Bob Hurley looked to preserve with a group of unproven, underachieving, now-seniors. 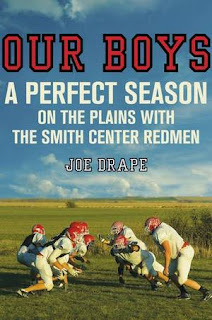 Joe Drape's Our Boys: A Perfect Season on the Plains with the Smith Center Redmen reflects both of these themes - a town with an identity directly tied to its football team, and the pressures faced by adolescents held to standards on and off the field of play in the shadow of teams before them. 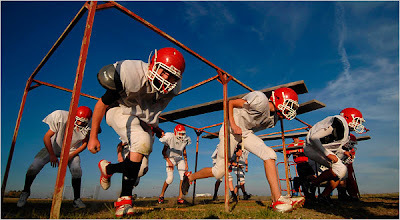 The Smith City Redmen of Smith City, KS, currently has the longest active win streak in high school football. With that distinction comes pressure and jealousy. Yet, head coach Roger Barta instills the notion in his teams that the game is more than a game. That it isn't football players he is developing, it is men and future leaders, husband and fathers: "None of this is really about football....What I hope we are doing is sending kids into life who know that everyday means something." After going on location to pen a front page article on the team for the New York Times in 2007 ("A Football Power in a Small Kansas Town"), the article's popularity and his own fascination with the team and the town lead Drape back to Smith Center to follow the Redmen's continuing journey toward perfection. The resulting book is a beautiful portrait of spirit and community. We caught up with Drape to talk about Our Boys and his experience. HuggingHaroldReynolds: Buzz Bissenger drew criticism from Odessa residents after Friday Night Lights was published when they felt he portrayed them unfairly, namely on the social front. Conversely, "Our Boys" paints Smith Center in almost an entirely positive light. As someone who admittedly became so entrenched in the Smith Center community, do you feel you were able to remain entirely objective given your relationship with the town, players and coaching staff? Joe Drape: I got there with the mission of being fair and accurate and to let the reporting lead me to wherever it went. I checked with the police and the county attorney and around town to make sure I wasn’t missing some huge scandal or dark side. What’s between the covers is the story I left with: About a small community that takes its children seriously, and emphasizes values like love patience and hard work. Did I like the people and way of life? Absolutely. Did I make friends for life? Yeah. But I can look anyone in the eye and say that Our Boys is a fair, accurate and objective look at Smith Center, Kansas and it’s football team. HHR: Does the book's subtitle ("Perfect Season") take away from the drama unfolding in the chapters? JD: This was a point of spirited discussion at the publishing house with folks on both sides. I suggested adding the “perfect,” because a) I thought we were burying our lede. The Redmen do have the nation’s longest winning streak, and in this day and age of information over load I didn’t think we should act like nobody knew that. b) I believed there was enough tension in the narrative to keep the story moving. c) I thought it worked metaphorically. My family and I had a perfect season, too. It’s funny – I’ve heard from readers who totally missed that word in the title, and were surprised and satisfied when they end up reading. I’ve heard from some who thought the picture of “67” in the photo section ruined it for them. HHR: You talk about how a loss would affect the book's narrative/story - not necessarily in a bad way. In retrospect, how different would "Our Boys" have been if the streak was snapped in the beginning of the season or in the playoffs? JD: I thought then, and now more than ever, that when the Redmen lose, it will be one of Smith Center’s greatest hours. I think the town will rush the field and hug those guys and give him a big ovation. Coach Barta and the community really don’t focus on winning and losing. It’s about competing and being proud of their town and their way of life. It may have been a more poignant ending, but perhaps not as a well-read one. I think people are picking “Our Boys” up and it’s a New York Times bestseller because they are still winning, and folks want to read and be engaged by a successful team and town that has it’s priorities straight. HHR: Coach Barta has been accused of running up the score. He, the team and town have been accused of phoniness in relation to their wholesome, classy image. How would you address the coach and Smith Center football's critics? Is there even a hint of truth? JD: The Redmen are like the Yankees , the Red Sox and Notre Dame – you either love them or hate them. In the book, someone at a national coaches clinic accused him of running up the score after Smith Center gained national attention for the 72-point first quarter. The coach of the opponent that day, Plainville, was the first to come to his defense and said his team did it to themselves. If you go on, youtube.com, you’ll see fumble and interception returns and one calamity after another. It’s mainly message board folks who make the accusations. There’s no truth at all to it. HHR: You and your family wholeheartedly embraced the small town living you experienced. Why head back to the Big Apple after the experience? How has your young son adapted? JD: I have a job, and a good one, at a time when too many very good journalists can’t say that. Job-wise it would be impractical, right now, to live there. So I’m following the example of my 4-year-old Jack who is happy anywhere we go. He cruises into Smith Center and picks up with his friends. He scooters between people on the sidewalks of New York City smiling all the way. We got a foot in both places. HHR: What sort of pressure do the players feel to live up to on-the-field standards of perfection - from their peers, to their schoolmates to the townsfolk? Is it a fair expectation of 15-17 year olds? JD: They do feel the pressure, especially the seniors, because that winning streak is handed down like Excalibur in King Arthur. It’s all part of growing up, and I don’t think it is unreasonable for anyone to want to be the best. I think we all should want to that. At the end of the day, though, they do realize it is only a game. HHR: How closely do you follow the seniors in their collegiate careers? Do you remain in touch? JD: I just got back from Kansas, and I met three of the seniors Marshall McCall, Kris Lehmann and Trenton Terrill in Salina and we all had dinner. Marshall and Kris are playing at Hutchinson Juco in the Jayhawk league; and Trenton’s playing baseball at Bethany. I also went to the Redmen’s opening game and caught up with some other seniors. We’re all in good touch, and they know they have a friend in New York.